Each item you send to an Amazon fulfillment center requires a Amazon barcode label so that it can be tracked throughout the fulfillment process. 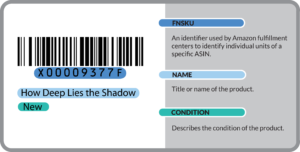 Unlike traditional retailers which require UPC/EAN or ISBN barcodes be placed on each item for scanning on Point of Sale registers, Amazon has different Product labeling requirements based on the type of shipment. Labeled inventory designates each product belongs to you, and is used by Amazon to receive and manage inventory shipped to Amazon Fulfillment Centers. The FBA Amazon Barcode Product Label ensures items received, sold and shipped to customers are attributed to the appropriate seller. Commingling your inventory makes it easier to fill customer orders more quickly and efficiently. If you enable commingled inventory for your seller account, when a buyer purchases a product from you, Amazon will send an identical item from the fulfillment center closest to the buyer to expedite delivery, even if it was originally sent to the fulfillment center by a different seller. Amazon transfers an item from your inventory into the other seller’s inventory to compensate them, and you get the credit for the sale. The item must have a UPC or EAN in a barcode form for the fulfillment centers to scan when they receive the product. Note: Amazon reserves the right to change the qualifications for Stickerless, Commingled Inventory at any time. Amazon sellers who are approved for ‘Stickerless Commingled Inventory’ need to identify each item with the existing UPC or EAN barcode on eligible products.